Depending upon the nature of your particular library spaces, it may be useful to mediate room bookings so you have more control over who is using that space. For example, let's say you have a really specialized space like a recording studio. Since only one person at a time can use the studio, you may want to give priority to people working on class projects, or participating in certain courses. By mediating the booking requests for your studio, you can review and approve each request that comes in. If mediation is enabled for that category of spaces, then all new booking requests must first be approved by designated staff before the booking can be confirmed. Plus, if you're using a custom booking form for those spaces, you can even ask the patron why they need the space, what equipment would be needed, and even if they would like any training or assistance getting set up. To review pending room booking requests, go to Spaces > Mediation. Select the Location and Category of rooms you want to review, using the dropdowns at the top of the page. This will display all of the tentative bookings for that category. To view only those bookings requiring mediation, leave the Status dropdown on Mediation Tentative. Use the date picker to adjust the date range of bookings to view. To search all tentative bookings in your system, select the Search All Locations checkbox. Click the Go button to apply your filters. To review a booking, click on its Approve/Deny button. Review the booking information as needed. At the top of the booking's page, you'll see the user's recent booking history for spaces in this category. Click on the View Statistics button for a summary of the user's entire booking history. 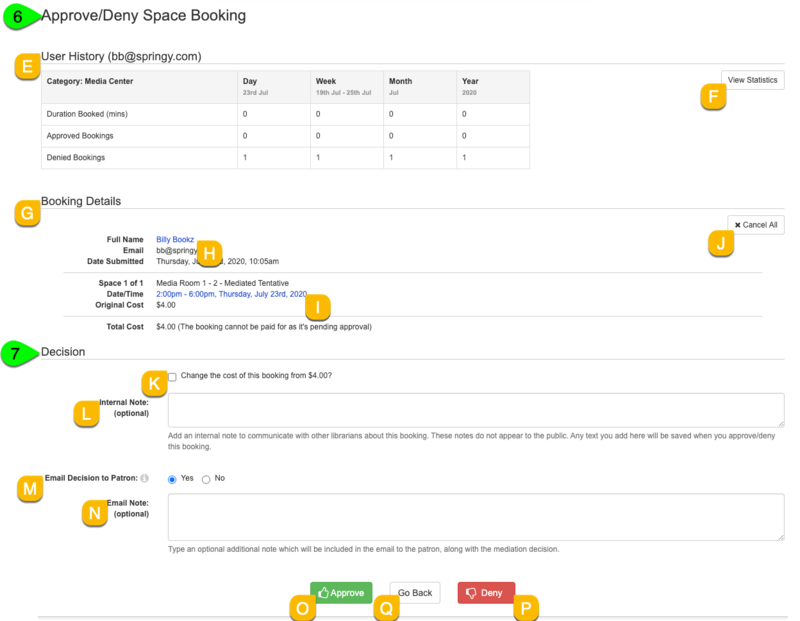 The Booking Details section will show the booking information and booking form responses. Click on the Edit () icon next to the booking's Date/Time to modify its start and/or end dates & times. Click on the Cancel () icon next to the booking's date and time to remove it from the booking. To cancel all spaces & items in the booking, click on the Cancel All button. Click on the Edit () icon next to the patron's name to modify the patron's info and booking form responses. The Decision section is where you can approve or deny the booking. When you log an internal note, it will be visible to staff when evaluating future bookings from this patron. If you'd like to notify the patron of the decision, select Yes for Email Decision to Patron. To include a note in the notification email, enter it in the Email Note field. This can help add context for your decision, or provide special instructions or conditions. Click the Approve button to confirm the booking. Otherwise, click on the Deny button to reject the booking request and keep the space available for other patrons. To return to the Space Mediation page without responding, click the Go Back button. Select the Location and Category you want to view from the dropdowns at the top of the page. Select the appropriate booking status from the Status dropdown. Use the Date filter to customize the date range to view. If you'd like to search for mediated bookings system-wide, select the Search All Locations checkbox. Click the Go button. This will display a list of the relevant bookings in that category and status.